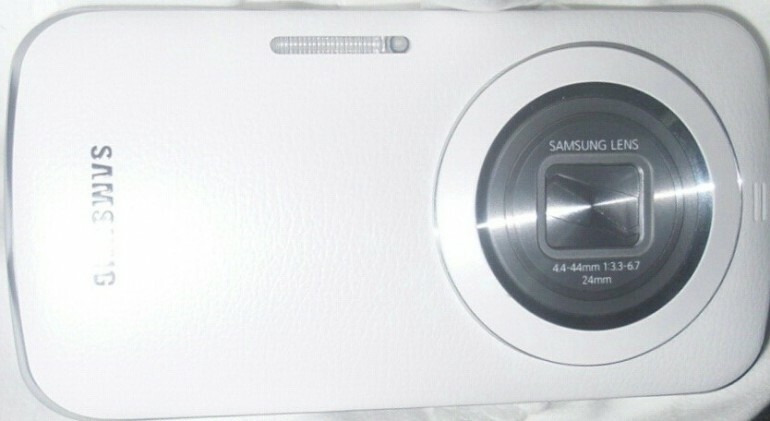 An image purported to be the new Samsung Galaxy S5 Zoom has appeared online. While some rumoured specs of the device was revealed some weeks back, this is the first time an image of the device has appeared. The image was uploaded on a simplesite.com domain, with very little information to go by with regards to the source of the image. The page also states that the device will be called the Galaxy K Zoom, and it will be “much thinner and lighter” than the Galaxy S4 Zoom. From the image, it can be seen that the Galaxy K Zoom will sport an extra large sensor – but without the enlarged bottom which doubled up as a hand grip, which could make the Galaxy K Zoom look similar to the Nokia Lumia 1020. In addition, the image also shows that the Galaxy K Zoom would have a similar faux-leather back cover that is similar to the Galaxy Note 3. The site also seems to confirm the initial rumours of the S5 Zoom/K Zoom’s specs: 4.8-inch 720p display, an Exynos 5 Hexa processor, 19/20MP rear camera, and Android 4.4.2. Unfortunately, no information on the release date was revealed…yet.